It is not an uncommon situation to find yourself needing to switch iPhones at home. Maybe you just bought a new iPhone and you intend to start using it. Since your content is on the old iPhone, you have to figure out a way to transfer it to the new device. This article will show you how to switch to new iPhone at home. How to Switch Certain Types of Data to New iPhone? Step 1: Turn on your new iPhone and place it close to your current iPhone. A Quick Start screen should appear. The screen will offer you the option to use your Apple ID to set up the new iPhone. Confirm it is the correct Apple ID and then click Continue. Turn on Bluetooth if Continue option is not available. Step 2: Hold the new device over the animation that appears on your old device and center it in the viewfinder. "Finish on New [Device]" should appear. If the camera is unusable, click Authenticate Manually and follow the steps which appear. Step 3: If prompted, enter current iPhone passcode on the new Device. Step 4: Set up Face ID and Touch ID by following the instructions. Step 5: Enter Apple ID password on the new device if prompted. 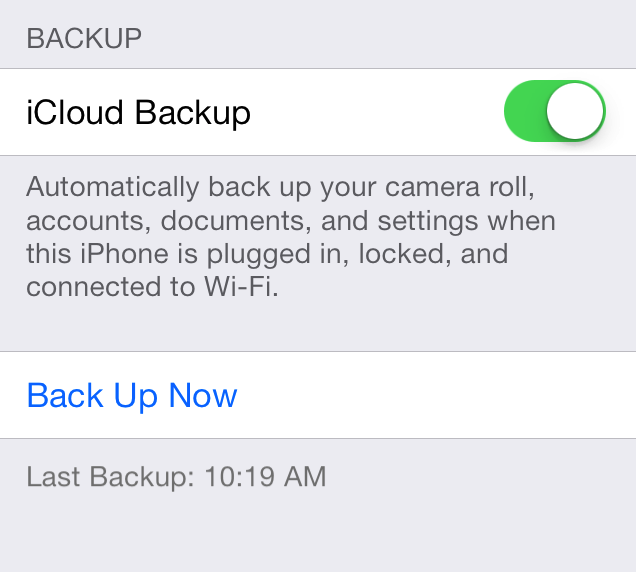 Step 6: You can restore your data, apps, and settings from the iCloud backup. You also get to choose the settings to transfer when you finally select a backup. To update iCloud backup and also for the pictures, music, and apps to be downloaded from iCloud, you will need a Wi-Fi connection. Step 7: Keep your iPhones close to each other for settings, passwords, and information to be transferred successfully. Step 1: Connect the old iPhone to Wi-Fi. Step 2: Open settings, tap [your name], click iCloud, and then tap iCloud Backup. For iOS 10.2 and below open Settings, tap iCloud, and then Backup. 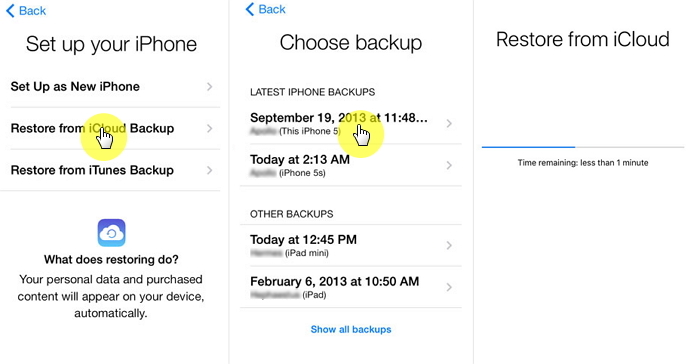 Step 3: Toggle on iCloud Backup and Click Back Up Now. Keep the device connected to Wi-Fi for Back up to finish. Step 1: Turn your new device on. You should see a "Hello" screen. You have to erase the phone before proceeding if you had already set it up. Step 2: Follow onscreen steps until Wi-Fi screen appears. Step 3: Join a Wi-Fi network. Follow onscreen steps to the Apps & Data screen. Click Restore from iCloud Backup. Step 4: Log into iCloud. Step 5: Select a backup when asked. Check data and size to make sure it is the correct backup. Step 6: If you had purchased App Store and iTunes content using multiple Apple IDs, you will be required to log in using each ID. If you can't remember the passwords, just skip this. Step 7: Keep your device connected to Wi-Fi for the set up to complete. Keep the device plugged into power for the media content and apps to be downloaded. Step 1: Connect the device to the computer. Step 2: Open iTunes and select the iPhone. Step 3: Encrypt your Health and Activity data by selecting the Encrypt [Device] backup box and create a password you can remember. Just tap Back Up Now if you are backing up regular data. Step 1: Turn your iPhone on. You should see the "Hello" screen. Erase the iPhone before proceeding if it is already set up. Step 2: Follow onscreen steps until you reach Apps & Data screen. Click Restore from iTunes Backup. Tap Next. Step 3: Connect the device to the computer that backed up the old iPhone to iTunes. Step 4: Open iTunes and select the iPhone. 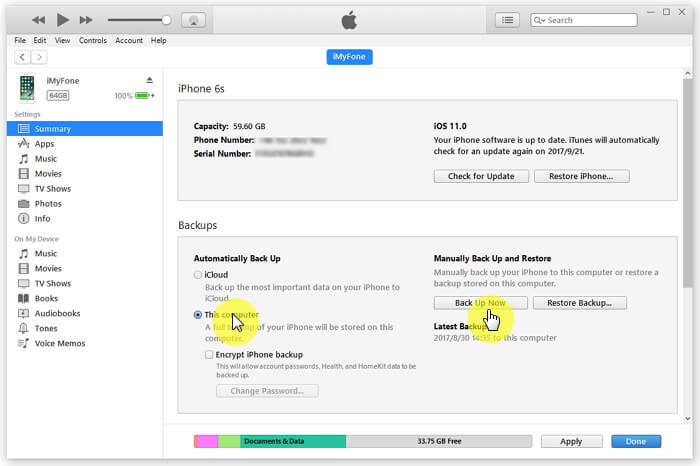 Step 5: Choose Restore Backup and then select the correct Backup. Step 6: You have to enter a password to restore an encrypted backup. Step 7: Complete the setup steps after restoration is done. 4. How to Switch Certain Types of Data to New iPhone? Allowing you to restore iCloud, iTunes, and iMyFone Backups selectively. You get to extract 18+ data types from your backups and your device to computer for more use. 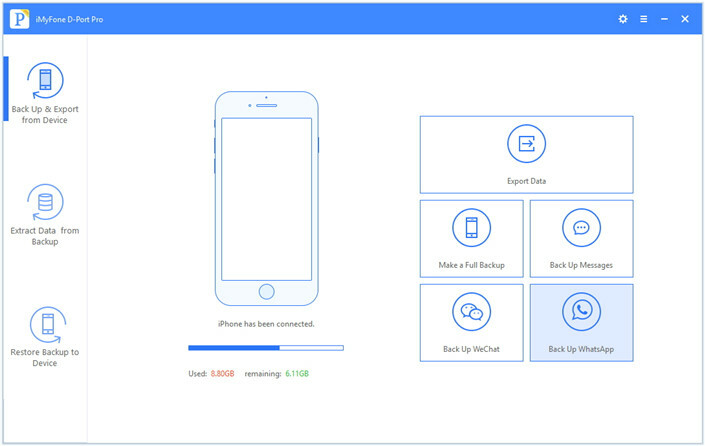 You get to back up all your iOS devices without overwriting any of your previous backups. 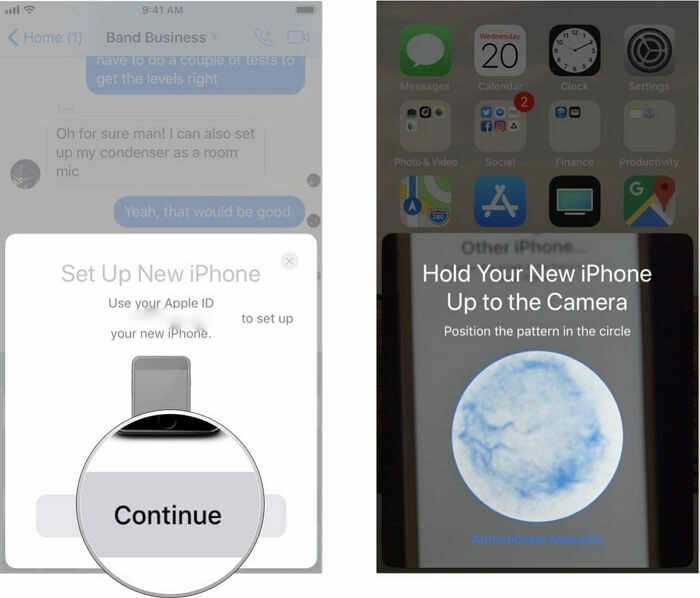 Step 1: After connecting your iPhone to the computer and launching iMyFone D-Port Pro, tap Back Up & Export from Device. Click Back Up WhatsApp. Step 2: Tap Back Up and keep your iPhone connected to the computer for the backup process to finish. Step 1: Connect the new iPhone to the computer and tap Restore Backup to Device on iMyFone D-Port Pro. Select WhatsApp backup and tap Next. Step 2: Tap Next again and wait as the WhatsApp backup is scanned. Preview the data and then tap Restore. 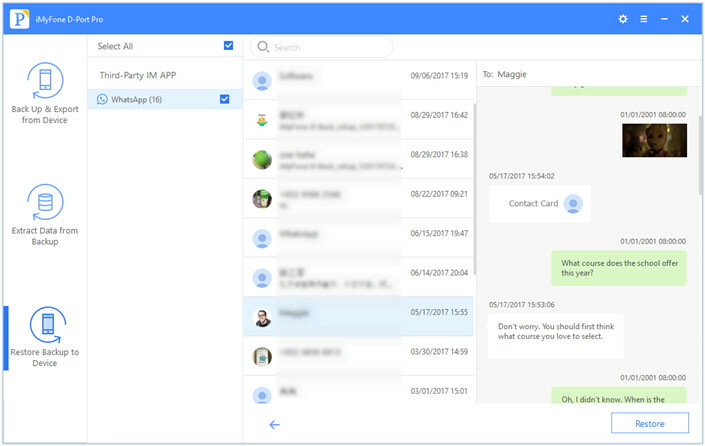 You can switch other types of data, such as messages, WeChat , and contacts by yourself with similar steps. If you have been thinking of how to switch iPhones at home, this article will help you do this. The first three methods we have described in this article will help you switch from one iPhone to another completely. But if you need to switch data selectively, use iMyFone D-Port Pro and follow the steps we have outlined above.